The LocHal is a new, world-class urban living room for Tilburg in a former locomotive shed of the Dutch National Railways. The project is the result of a close architectural and design collaboration led by Civic Architects. The LocHal has redefined the function of a library in today’s digital era. While there are the usual facilities for the traditional ‘book consumer’, the new library also provides ample opportunity for the creation of new knowledge. ‘Curatorship’ has become just as important as the books themselves: interaction with human experts offers a deeper, richer way to acquire knowledge and information. This new role is facilitated by the architecture. In addition to various areas for lectures and public events, the library has a number of ‘labs’ (laboratories) where visitors can learn new skills. These labs, with their remarkable design, can be found throughout the building. The atmosphere of the building is that of a productive knowledge institute. The main structure, various original features which have been carefully preserved and the new additions make use of ‘honest’ materials such as black steel, concrete, glass and wood, applied over large surfaces. Textile screens add accents of scale and colour. It is the main structure which determines the architectural language, while the details adapt themselves to the scale of the building. Amid all this openness, certain events and activities may call for a smaller scale or a degree of privacy. Inside Outside has therefore designed six huge textile screens which extend to ceiling height, thus accentuating the scale of the building while also defining separate areas and improving the acoustic properties of the interior. The interior design employs a number of distinct concepts to create different settings for various activities such as meeting, collaboration or quiet reading. Three huge tables, designed in the form of a train’s ‘bogie’ (undercarriage), stand on the original tracks. They form an extension to the bar area but can also be pushed together to create a stage or catwalk, with the surrounding steps providing seating for the audience. 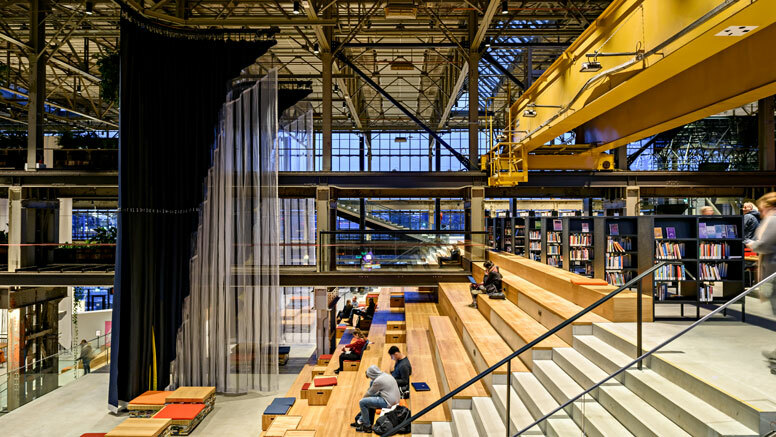 The immense industrial columns have been repurposed as reading and study areas by the addition of wooden tables and lighting. 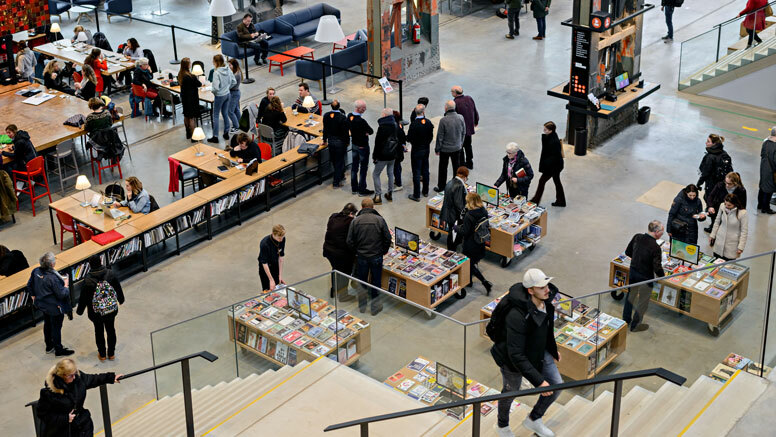 The library’s collection is arranged on large, movable bookcases to create the inviting atmosphere of a modern bookstore. There is also a children’s library, the design of which draws inspiration from De Efteling, the fairy-tale theme park near Tilburg. Young visitors can wander through giant storybooks and browse bookcases in the form of coloured pencils and rulers. The building’s design is the result of close collaboration between Civic Architects, Braaksma & Roos Architectenbureau and Inside Outside/Petra Blaisse. The interior design of the library, the various ‘laboratories’, the café and offices are by Mecanoo, while the engineering consultancy Arup advised on aspects such as sustainability, re-use and acoustic design. LocHal is Tilburg's new public city forum. Project description by Civic Architects. Interior design description on the Mecanoo website.